“Tell me you want me, tell me you need me to love you. I’ve been searching everywhere!” Those memorable lyrics were written by an American band entitled Thirdstory who consists of artists by the name of Ben Lusher, Richard Saunders, and Elliott Skinner. Thirdstory graced the 9:30 Club on April 12 at 9 p.m., a month after releasing their 11-track debut album Coldheart (2018) on March 9. Thirdstory is almost complete with their latest US tour with six shows remaining! The band is known for their remarkable harmonies and unique, electric blend of different genres which was very much shown throughout their performance that night. At 8 p.m., the show opened with an artist named Grace Weber out of New York who made a fiery entrance with one of her tracks titled, “Through the Fire”. She was accompanied by her drummer, Alvin and keyboardist, Brandon Butler. Weber was very active with the crowd encouraging everyone to sing along with her while she showcased her dynamic vocal range. In addition, Grace premiered a song from her upcoming album with The Social Experiment called, “Water’s Edge”. Finally, Grace ended her opening set covering Daniel Caesar’s “We Find Love” and incorporated an epic call and response with the crowd while creating a segue to the headliner of the evening. Thirdstory began their set with “Hit The Ceiling” which is one of my favorite tracks from the album. The group’s harmonies were truly indescribable, and it is awesome to me how they found one another and their voices blend so well along with their notable instrumentation. 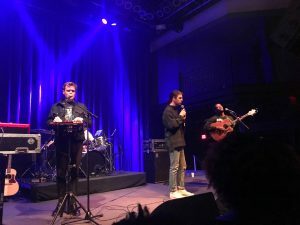 Along with performing songs from their album, Thirdstory also took the crowd back to their youtube days by doing an amazing live acoustic rendition of Drake’s “Hotline Bling” which was definitely a crowd favorite. After paying a tribute to one of their inspirations, “Adrienne Lenker” and performing more songs from the album, Thirdstory ended the night with their beautiful song entitled, “Searching For a Feeling” which moved the audience into wanting an encore after they concluded. So, the band returned to the stage and performed their well-known song “Still In Love” ending the show in high spirits. I recently just started following Thirdstory thanks to a good friend of mine and I cannot stop singing their songs especially after experiencing them live. Their lyrics, their harmonies, and their instrumentation is breathtaking, and I encourage each and every one of you who reads this review to listen to Coldheart and tell your friends!